L-188A seen in 'Santo' contra los secuestradores. The Lockheed L-188 Electra is a four-engined, turboprop airliner. The aircraft first flew in 1957 and remains in service as of 2010, with the US Navy as the Lockheed P-3 Orion, as well as other militaries. 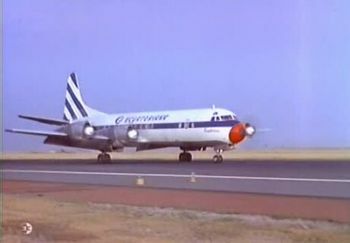 This page lists all films that feature a variation of the Lockheed L-188 Electra. For the military variant, see Lockheed P-3 Orion. This page was last modified on 2 January 2014, at 04:38.